THE post-mortem for most modern-day politicised climate “science”! 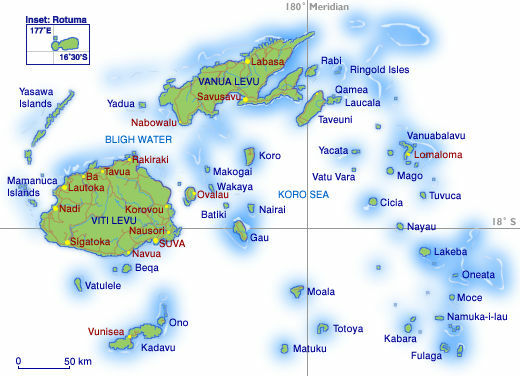 Fiji Map from Turtle Airways Seaplanes. Fiji International Airport is at Nadi. Published this month is an update on sea levels at Fiji, and thankfully the threat level can be dialed way down. (H/T Tallbloke) The Research Article: Our Oceans-Our Future: New Evidence-based Sea Level Records from the Fiji Islands for the Last 500 years Indicating Rotational Eustasy and Absence of a Present Rise in Sea Level by Nils-Axel Mörner, Paleogeophysics & Geodynamics, Stockholm, Sweden. Excerpts with my bolds. Previously, no study in the Fiji Islands had been devoted to the sea level changes of the last 500 years. No serious prediction can be made unless we have a good understanding of the sea level changes today and in the past centuries. Therefore, this study fills a gap, and provides real observational facts to assess the question of present sea level changes.